In June of 1989, I finished fifth grade. I don’t recall it being a particularly challenging academic year but, for reasons no one recalls, my parents decided getting through it merited a reward. The intended gift was an R/C car, the sort with a miniature two-stroke combustion engine under its clip-on plastic body. The business of building [i], tuning, racing and cleaning the little buzzing machine was bound to keep me busy over the otherwise languid summer months. A trip to Daniel’s Den changed everything. Small, cramped, the Den was a local book and magazine shop run by a skinny little hippie with a beard, long hair and sleepy eyes. It smelled vaguely of incense. 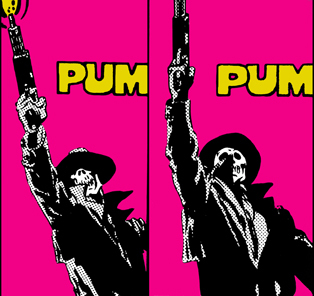 Black light posters for bands from the Grateful Dead to Iron Maiden hung from the ceiling. This is the place I got my first set of Dungeons & Dragons dice, where I bought my first Wolverine comic, where I saw the Satanic Bible for the first time (on a tantalizingly high shelf labeled 18+ Only). 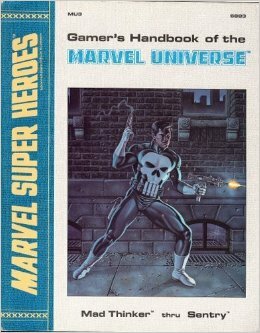 The Gamer’s Handbook of the Marvel Universe is the complete last word on the heroes, villains and other characters in the Marvel Universe that the players of the Marvel Super Heroes role-playing game have been looking for! And wait a minute, there were role playing games besides Dungeons & Dragons? Abomination through Dreadnought. Eel through Mad-Dog. Mad Thinker to Sentry (OK, those aren’t the most interesting character names, but Punisher was in there somewhere). Serpent Society to Zzzax. What on earth is a Zzzax? A Serpent Society? Tell me more. I asked my mom to buy them for me. She said I could get one. I looked at her as if she was the Mad Thinker. How on earth could you only get one of a four-volume set? This appeal to logic had some effect. She gave me a choice: The Gamer’s Handbooks of the Marvel Universe, or the R/C car. It was the first choice I remember making that had a known, long-term consequence before I made it. This wasn’t chocolate or vanilla cake. This wasn’t even deciding between some books or a toy car. I was deciding the shape of my summer, how I was going to spend that vast expanse of hours and days. Would it be cleaning plastic car parts or immersed in a fictional universe? While the other kids on the block raced their R/C cars around that summer [iii], I was in my air-conditioned bedroom, poring through a reference book to a game I didn’t own or play. Every page had a full body portrait, a block of stats (meaningless to me at the time) and a detailed biography of the character up to that point in time. I filled notebooks with copy sketches, memorizing the contours of capes and armor. I absorbed the histories. I remember sitting in the car with the four handbooks in the bag and hesitating before I tore open the cellophane. Opening them meant not going back. I couldn’t return them without the cellophane. What if I had made the wrong choice? I kept the handbooks, which came five-hole punched, in a big red binder that had, until then, housed my half-hearted baseball card collection. A modest collection of Marvel comics grew up around it – primarily Wolverine, Captain America and any old issue of Moon Knight I could lay my hands on. Most of my early comics featured the Scourge, a masked vigilante who specialized in killing minor super villains. He had been the focus of an ongoing, company-wide story line, popping up here and there to blow away some rando with his trademark explosive bullets. The height of his career was the massacre at the Bar With No Name, a meeting place for low-rent super villains, where Scourge posed as the bartender in order to snuff 18 losers. The scant information on the super-failures in the handbooks made them all the more intriguing. Looking back, the concept is a little thin, what with the Punisher running around the same universe, but I was a sucker for a guy with a skull mask and a trench coat. I had met the Scourge for the first time in the Handbook and later in two in-depth articles chronicling his murders in Dragon Magazine 129 and 130. 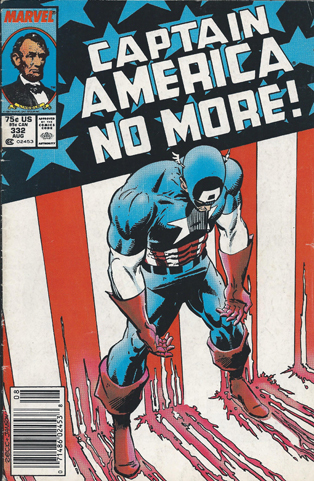 The comics came last, but they opened the door to one of my favorite comic book runs of the era – Mark Gruenwald’s decade-long stint writing Captain America. 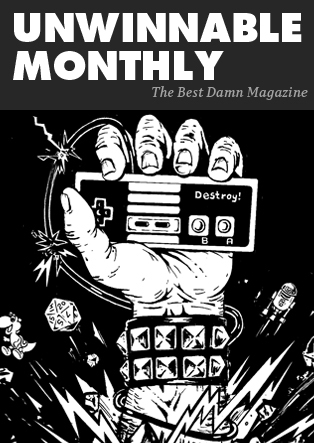 It is a magical 135 issues. Cap is a hopeless goody-two-shoes stuck in the mud of the increasingly gritty and morally ambiguous 80s and 90s. The scores of villains he faces, from dopey to insidious, force him to confront the changing world. The need for secret identities and superhero oversight are open questions. Organizations like the Serpent Society turned what used to feel like a children’s game of cops and robbers into something more chaotic and sinister. Others villains, like Super-Patriot, Flag-Smasher and the Watchdogs, highlighted the period’s rocky political landscape. Streets of Poison tackles the illegal drug trade. The Armadillo, betrayed by his wife, attempts suicide. The Porcupine, dying, declares himself a loser, despite Cap’s consoling words. The more comics I got, the less I needed the handbooks. Eventually, I slid the red binder under my bed. Later, it might have wound up in the flood-prone basement, or was lent out and never returned. Whatever the case, it disappeared. It took me years to want to replace them, then it took me years to find them at a decent price (I have bouts of painful nostalgia, but that doesn’t mean I will pay an arm and a leg to alleviate them). They arrived today. I don’t know why that matters, but it does. There’s other weird things. There are entries I remember that aren’t here. Where is Man-Wolf? I can see the illustration so clearly, the yellow and green space suit, the white wolf’s head upturned in a howl. It isn’t here, though. John Jameson is, in the same suit, though. Maybe I have to leave the page out in the light of the full moon to see the art I remember. My god, did I laugh with pure joy at some of the things I saw in the theater this past weekend, when I took my mom to see Captain America: Civil War. That little slice of happiness has been building up for nearly thirty years. Fifth grade was the first year of school that I was bored. Boredom, it turns out, is my greatest foe, my arch-nemesis. Once I am bored of something, I no longer see the point. Once I no longer see the point, I don’t want to do it anymore and then, good luck twisting my arm. I am aware of just how little time we all have; I’ll be fucked if I am going to waste any of mine. Looking back, it is a small miracle that my boredom didn’t stop me from getting through high school, that it let me last as long as I did at some of my previous jobs. I am surprised I didn’t get in more trouble. I feel relieved to have the handbooks back on my shelf. Choosing them over the R/C car led me further into Dungeons & Dragons, where I met and kept some of my dearest friends. Piles of comics circulate among us, Iron Maiden albums are on the stereo, horror movies in the VCR, videogames on the TV. For the last six years, I have had a website and a magazine, where I write things like this, about all the silly things people have suggested over the years that I abandon in pursuit of grown-up things. I remember sitting in the car, in 1988, worried that I made the wrong choice. In comic book terms, that was a point of divergence in the timeline. Somewhere, in some alternate universe, is a Stu that chose the R/C car. I’d like to meet him and see what he thinks, if he even remember The Gamer’s Handbook of the Marvel Universe. I wonder if he enjoys being an engineer, or a mechanic, or whatever he wound up being. I wonder if he’s happy. I also wonder if he’s bored, because in this timeline? It hasn’t been easy, it isn’t always fun, but it is never, ever boring. i Years later, my father would hotrod a 1971 Ford Torino. It was a beast of a car, did a quarter mile in 14 seconds, had an engine that roared so loud I could hear it in my high school English class half a mile away and, strangely, had a body that clipped on, just like the R/C cars. ii If you give me a book arranged in alphabetical order, I will always start reading it backwards from “Z.” I have no idea why. iii I listened to Appetite for Destruction, by Guns N’ Roses, almost exclusively that summer. My first album with cuss words (I have no idea why my folks gave it to me, or let me keep it after they heard it), every time I hear “Paradise City,” I think of this summer. I had no idea what it was about, I just knew Axl mentioned Captain America.